She's one of the adventure game's handful of playable characters. Thimbleweed Park, the point-and-click adventure from some of the people behind Maniac Mansion, continues to impress, not least because of the extraordinary pixel art of Mark Ferrari and Octavi Navarro. The latest trailer, released to coincide with Gamescom, features that pixel art aplenty, while focusing on one of the game's multiple playable characters: Delores Edmund, heiress to a pillow factory. But it's a pretty good setup for the game as a whole, its central mystery of a murdered person teased, oh but also there are ghosts. Small towns continue to be some of the most exciting settings for games, particularly if they're explored in sufficient detail. You're learning a place as you explore, getting to know the inhabitants and the history of a manageably small location, and that sort of rich connection to a place is why people keep coming back to Twin Peaks, Earthbound, and things like Twin Peaks and Earthbound. 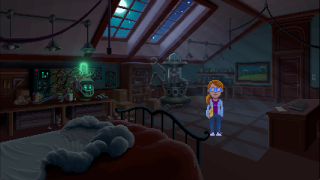 I'm hoping Thimbleweed Park will be like that, and I'm definitely getting that vibe, although obviously we've not seen much of the game yet. We'll know for sure when it releases, early next year.